Itching for some cometary action? After a fine winter’s performance from Comet C/2014 Q2 Lovejoy, 2015 has seen a dearth of good northern hemisphere comets. That’s about to change, however, as Comet C/2013 US10 Catalina joins the planetary lineup currently gracing the dawn sky in early November. Currently located in the constellation Centaurus and shining at magnitude +6, Comet US10 Catalina has already put on a fine show for southern hemisphere observers over the last few months during Act I. Currently buried in the dusk sky, Comet US10 Catalina is bashful right now, as it shares nearly the same right ascension with the Sun over the next few weeks, passing just eight degrees from our nearest star as seen from our Earthly vantage point on November 7th — and perhaps passing juuusst inside of the field of view for SOHO’s LASCO C3 camera — and into the dawn sky. The altitude of Comet US10 Catalina in November and December at dawn as seen from latitude 30 degrees north. Image credit: Starry Night Education software. The hunt is on come early November, as Comet US 10 Catalina vaults into the dawn sky. From 30 degrees north latitude here in Central Florida, the comet breaks 10 degrees elevation an hour prior to local sunrise right around November 20th. This should see the comet peaking in brightness right around magnitude +5 near perihelion the same week on November 16th. The angle of the comet’s orbit is favorable for northern hemisphere viewers in mid-November, as viewers start getting good looks in the early morning from latitude 30 degrees northward and the comet gains about a degree of elevation per day. This will bring it up out of the murk of twilight and into binocular view. Mark your calendar for the morning of December 7th, as the crescent Moon, Venus and a (hopefully!) +5 magnitude comet US10 Catalina will all fit within a five degree circle. 20-Crosses into the constellation Hydra. 2-Crosses into the constellation Libra. 16-Crosses into the constellation Virgo. 16-Reaches perihelion at 0.823 AU (127.6 million kilometers) from Sun. 26-Crosses the ecliptic plane northward. 27-Passes less than one degree from the +4.5 magnitude star Lambda Virginis. 7-Fits inside a five degree circle with Venus and the waning crescent Moon. 8-Passes less than one degree from the +4 magnitude star Syrma (Iota Virginis). 17-Crosses the celestial equator northward. 24-Crosses into the constellation Boötes. In January, Comet US10 Catalina starts the New Year passing less than a degree from the -0.05 magnitude star Arcturus. From there, the comet may drop below +6 magnitude and naked eye visibility by mid-month, just prior to its closest approach to the Earth at 0.725 AU (112.3 million kilometers) on January 17th. By February 1st, the comet may drop below +10th magnitude and binocular visibility, into the sole visual domain of large light bucket telescopes under dark skies. Or not. Comets and predictions of comet brightness are always notoriously fickle, and rely mainly on just how the comet performs near perihelion. Then there’s twilight extinction to contend with, and the fact that the precious magnitude of the comet is diffused over its extended surface area, often causing the comet to appear fainter visually than the quoted magnitude. But do not despair. Comets frequently under-perform pre-perihelion passage, only to put on brilliant shows after. Astronomers discovered Comet US10 Catalina on Halloween 2013 from the Catalina Sky Survey based just outside of Tucson, Arizona. On a several million year orbit, all indications are that Comet US10 Catalina is a dynamically new Oort Cloud visitor and will probably get ejected from the solar system after this all-too brief fling with the Sun. Its max velocity at perihelion will be 46.4 kilometers per second, three times faster than the New Horizons spacecraft currently on an escape trajectory out of the solar system. But such was not to be. More to come. Perhaps we’ll draft up an Act III for US10 Catalina in early January if it’s a top performer. Live in (or planning on visiting) the southern hemisphere soon? A first time visitor to the inner solar system is ready to put on the first of a two part act starting this month, as Comet C/2013 US10 Catalina breaks +10th magnitude and crosses southern hemisphere skies. Though we’ve overdue for a this generation’s ‘great comet,’ we’ve had a steady stream of fine binocular comets in 2015, including 2014 Q2 Lovejoy, 2014 Q1 PanSTARRS, and 2015 G2 MASTER. US10 Catalina looks to follow this trend, topping out at just above naked eye visibility in late 2015 going into early 2016. Discovered by the Catalina Sky Survey on Halloween 2013, the comet received its unusual ‘US10’ designation as it was initially thought to be an asteroid early on in a periodic six year orbit, until a longer observation arc was completed. This is not an unusual situation, as new objects are often lost in the Sun’s glare before their orbit can be refined. We now know that US10 Catalina is on a million year long journey from the distant Oort Cloud. Most likely, it was disturbed by an unrecorded close stellar passage long ago. We say that such comets are dynamically new, and this passage will eject US10 Catalina from the solar system. The comet also has a highly inclined orbit tilted almost 149 degrees relative to the ecliptic, and was at +19th magnitude and 7.7 AU from the Earth when it was discovered, suggesting an intrinsically bright comet. Prospects for US10 Catalina currently favor latitude 35 degrees north southward in late June, though that’ll change radically as the comet makes the plunge south this summer. As of this writing, US10 Catalina was at +11 magnitude ‘with a bullet’ and currently sits in the constellation Sculptor at a declination -30 degrees in the southern sky. Binoculars are our favorite tools for observing comets, as they’ve easy to sweep the skies with on our cometary quest. As with nebulae and deep sky objects, keep in mind that quoted magnitude for a comet is spread out over its apparent surface area, causing them to appear fainter than a star of the same magnitude. July 1st: May break binocular visibility, at +10th magnitude. July 6th: Crosses into the constellation of Phoenix. July 23rd: Crosses into the constellation Grus. July 25th: Crosses into the constellation Tucana. July 26th: Passes the +4th magnitude star Gamma Tucanae. August 2nd: Passes the +4.5th magnitude star Delta Tucanae. August 4th: Crosses into the constellation Indus. August 6th: Photo op: Passes 12 degrees from 47 Tucanae and the Small Magellanic Cloud. August 8th: Crosses into the constellation Pavo. August 12th: Passes the +4th magnitude star Epsilon Pavonis. August 14th: Reaches its greatest declination south at almost -74 degrees. August 15th: Sits at 1.1 AU from the Earth. August 17th: Crosses into the constellation Apus. August 19th: Passes 5 degrees from the +7.7 magnitude globular cluster NGC 6362. August 22nd: Crosses into the constellation Triangulum Australe and passes the +1.9 magnitude star Atria. August 28th: Passes the +2.8 magnitude star Beta Trianguli Australis. August 29th: Passes 3 degrees from the +5th magnitude open cluster NGC 6025. From there, Comet US10 Catalina heads towards perihelion 0.8229 astronomical units from the Sun on November 15th, before vaulting up into the northern hemisphere sky in the early dawn. Like Comet Q2 Lovejoy last winter, US10 Catalina should top out at around +4th magnitude or so as it glides across the constellation Ursa Major just after New Years. And like many comets, the discriminating factor between a ‘great’ and ‘binocular comet’ this time around is simply a matter of orbital geometry. Had C/2013 US10 Catalina arrived at perihelion in the May time frame, it would’ve passed less than 0.2 AU (30 million kilometres) from the Earth! But that’s cosmic irony for you. Keep in mind, with Comet US10 Catalina being a dynamically new first time visitor to the inner solar system, it may well up brighten ahead of expectations. And there’s more to come… watch for Act II as we follow the continuing adventures of Comet C/2013 US10 Catalina this coming September! Did you catch the performance of Comet C/2014 Q2 Lovejoy earlier this year? Every year provides a few sure bets and surprises when it comes to binocular comets, and while we may still be long overdue for the next truly ‘Great Comet,’ 2015 has been no exception. This week, we’d like to turn your attention to two icy visitors to the inner solar system which may present the best bets comet-wise over the next few weeks: Comets C/2014 Q1 PanSTARRS and C/2015 G2 MASTER. First up is Comet C/2014 Q1 PanSTARRS. Discovered on August 16, 2014 by the Panoramic Survey Telescope & Rapid Response System (PanSTARRS) based atop Mount Haleakala in Hawaii, we’ve known of the potential for Q1 PanSTARRS to put on a decent show this summer for a while. In fact, it made our roundup of comets to watch for in our 101 Astronomical Events for 2015. Q1 PanSTARRS currently sits at +11th magnitude as a morning sky object in the constellation Pisces. On a 39,000 year long parabolic orbit inclined 45 degrees relative to the Earth’s orbit, Q1 PanSTARRS will leap up across the ecliptic on May 17th and perhaps reach +3rd magnitude as it nears perihelion in early July and transitions to the evening sky. An image of Comet C/2014 Q1 PanSTARRS shortly after discovery. Credit and copyright: Efrain Morales Rivera. Though it may put on its best show in July and August, a few caveats are in order. First, we’ll be looking at Q1 PanSTARRS beyond the summer Sun, and like C/2011 L4 PanSTARRS a few years back, it’ll never leave the dusk twilight, and will always appear against a low contrast backdrop. The May-June path of Comet Q1 PanSTARRS through the dawn sky as seen from latitude 30 degrees north. Credit: Starry Night Education software. May 16: Passes into the constellation Aries. May 16: The waning crescent Moon passes 2 degrees distant. May 17: Crosses northward through the ecliptic. May 20: May break +10th magnitude. June 11: Passes in to the constellation Taurus. June 12: Passes 2 degrees from M45 (The Pleiades). June 15: May break 6th magnitude. June 20: Passes into Perseus. June 21: Passes into Auriga. June 23: Passes +2.7 magnitude star Hassaleh (Iota Aurigae). June 25: Passes the +7.5 magnitude open cluster IC 410. June 26: Passes +6 magnitude Pinwheel Open Cluster (M36). 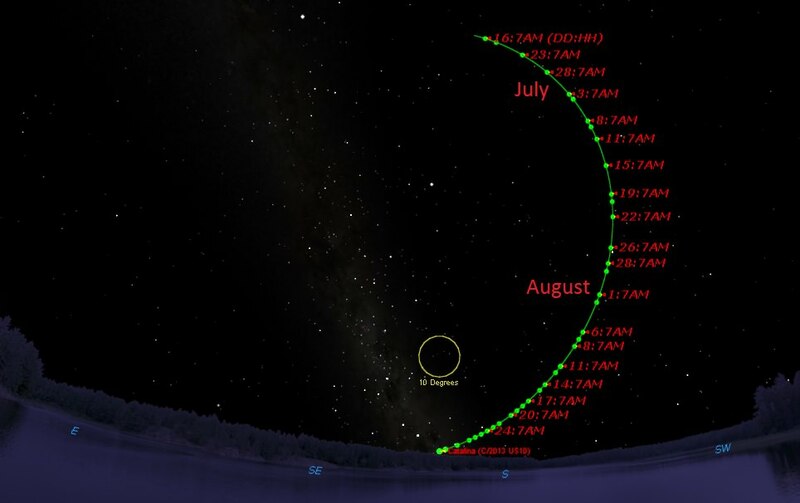 The July-August evening path of Q1 PanSTARRS as seen from latitude 30 degrees north. Credit: Starry Night Education software. July 2: Crosses into Gemini. July 3: Passes the +3.6 magnitude star Theta Geminorum. July 5: Passes 10 degrees north of the Sun and into the evening sky. July 6: Passes midway between Castor and Pollux. July 6: Reaches perihelion at 0.315 astronomical units (AU) from the Sun. July 7: May top out at +3rd magnitude. July 8: Crosses into Cancer. July 12: Photo Op: passes M44, the Beehive Cluster. July 13: Sits 30 degrees from Comet C/2015 G2 MASTER (see below). July 15: May drop below +6th magnitude. July 15: Crosses the ecliptic southward. July 17: The waxing crescent Moon passes 1.5 degrees south. July 19: Crosses into Leo. July 20: Closest to Earth, at 1.18 AU distant. July 21: Less than 10 degrees from Jupiter and Venus. July 22: Crosses into Sextans. July 26: Crosses the celestial equator southward. August 4: Crosses into Hydra. August 5: Crosses into Crater. August 18: Crosses back into Hydra. August 30: Crosses into Centaurus. September 1: Drops below +10th magnitude. The projected light curve of Q1 PanSTARRS over time. The black dots represent observations. Credit: Weekly Information about Bright Comets. The next comet on deck is the recently discovered C/2015 G2 MASTER. If you live in the southern hemisphere, G2 MASTER is the comet that perhaps you haven’t heard of, but should be watching in the dawn sky. Discovered last month on April 7 as by MASTER-SAAO (The Russian built Mobile Astronomical System of Telescope-Robots at the South African Astronomical Observatory), this is not only the first comet bagged by MASTER, but the first comet discovery from South Africa since 1978. G2 MASTER has already reached magnitude +7 and is currently crossing the constellation Sculptor. It is also currently only visible in the dawn sky south of 15 degrees north latitude, but images already show a short spiky tail jutting out from G2 MASTER, and the comet may rival Q2 Lovejoy’s performance from earlier this year. Expect G2 MASTER to top out at magnitude +6 as it nears perihelion in mid-May. Observers around 30 degrees north latitude in the southern U.S. should get their first good looks at G2 MASTER in late May, as it vaults up past Sirius and breaks 10 degrees elevation in the evening sky after sunset. Again, as with Q1 PanSTARRS, cometary performance versus twilight will be key! May 9: Crosses into Fornax. May 15: May top out at +6th magnitude. May 13: Closest to Earth at 0.47 AU. May 14: Crosses into Eridanus. May 16: Crosses into Caelum. May 17: Crosses into Lepus. May 20: Passes the +3.8 magnitude star Delta Leporis. May 23: Crosses into Canis Major. May 23: Reaches perihelion at 0.8 AU from the Sun. May 27: Crosses into Monoceros. May 28: Passes the +5.9 magnitude Open Cluster M50. June 8: Crosses northward over the celestial equator and into the constellation Canis Minor. July 1: May drop below 10th magnitude. G2 MASTER also crosses SOHO’s field of view on July 24th through August 4th, though it may be too faint to see at this point. Full Moons: June 2nd, July 2nd, July 31st, August 29th. New Moons: May 18th, June 16th, July 16th, August 14th. Binoculars are our favorite ‘weapon of choice’ for comet hunting. Online, Heavens-Above is a great resource for quickly and simply generating a given comet’s sky position in right ascension and declination; we always check out the Comet Observers Database and Seiichi Yoshida’s Weekly Information about Bright Comets to see what these denizens of the outer solar system are currently up to. Good luck, and be sure to regale us with your comet-hunting tales of tragedy and triumph! Keeping warm? Yesterday marked the start of astronomical winter for the northern hemisphere, meaning long nights and (hopefully) clear, cold skies. But we’ve also got another reason to brave the cold this week, as Comet C/2014 Q2 Lovejoy is set to put on a show for northern hemisphere observers. Already, Comet Q2 Lovejoy has been providing southern hemisphere observers with a fine celestial showing. Discovered by Australian comet hunter extraordinaire Terry Lovejoy on August 17th of this year as it glided across the constellation Puppis, Q2 Lovejoy has been brightening through early December ahead of expectations. We’ve already been getting some great images from Universe Today readers down south, and we can expect more in the weeks to come. This is Mr. Lovejoy’s fifth comet discovery, and many will remember how comet C/2011 W3 Lovejoy also survived a perilous perihelion passage just 140,000 kilometres from the surface of the Sun during the 2011 holiday season and went on to produce a brilliant display. 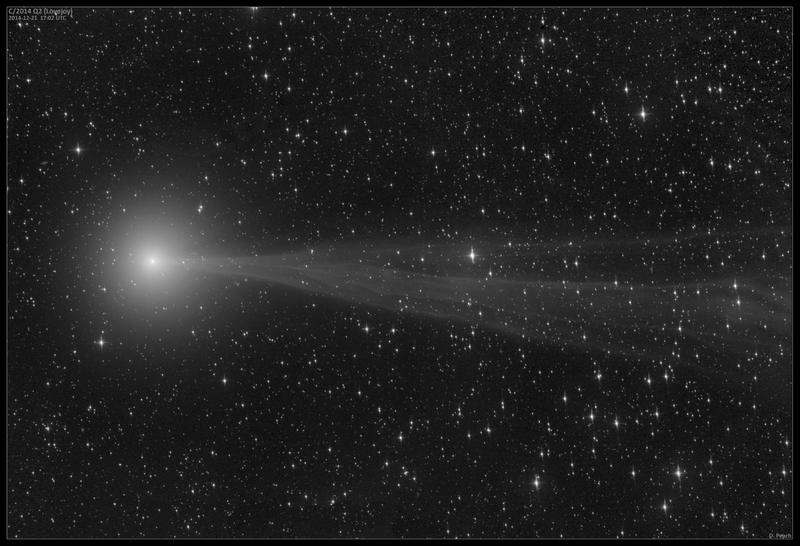 Q2 Lovejoy plus negative image taken from New Mexico on December 20th. Credit and copyright: Joseph Brimacombe. And although Comet 2012 S1 ISON failed to produce in 2014, we had a string of great binocular comets this year, including C/2014 E2 Jacques, K1 PanSTARRS, and A1 Siding Spring. Currently shining at magnitude +5.5, Q2 Lovejoy is a fine target for binoculars or a small telescope as it crosses the southern constellation of Columba into Lepus just after Christmas Day. Sirius currently makes a good guidepost, as the comet sits about 19 degrees southeast of the brightest star in the sky. And speaking of Sirius, don’t forget to try your hand at spotting its white dwarf companion in 2015! A black and white view of Comet Lovejoy, taken on Dec. 21, 2014, highlighting the comet’s dramatic tail. Credit and copyright: Damian Peach. Q2 Lovejoy also has a high orbital inclination of 80.3 degrees relative to the ecliptic, which is good news, as it will be plunging rapidly northward as it makes its closest passage by Earth on January 7th at 70.2 million kilometres or 0.47 A.U.s distant. Note that not only will the comet pass extremely close to the globular cluster M79 (photo op!) on the night of December 29th, but will also pass within 10 degrees of the Pleiades in January before threading its way northward between the famous Double Cluster in Perseus and the Andromeda Galaxy. Note: the photo is of Comet C/2014 E2 Jacques from earlier this year. (Credit: the Virtual Telescope Project). Expect Q2 Lovejoy to ride highest to the south around local midnight starting on January 1st, and transit the local meridian at 8-9 PM local by mid-month. Keen eyed observers have already managed to spy Q2 Lovejoy unaided from a dark sky site, and we expect this to be the general case for most observers by New Year’s Day. As of this writing, Q2 Lovejoy displays a fine coma 10’ wide with a 7 degree long, fan-shaped tail. Comet Q2 Lovejoy imaged from Siding Spring Observatory in New South Wales, Australia on December 18th. Credit and copyright: Roger Hutchinson. 28- Crosses into the constellation Lepus. 29- Passes less than 10’ — a third of the diameter of the Full Moon — from the 7.7 magnitude globular cluster NGC 1904 (Messier 79). The path of Comet Q2 Lovejoy from December 23rd through February 1st. Credit: Starry Night Education software. 1- May break naked eye visibility at magnitude +6. 2- Passes into the constellation Eridanus and reaches opposition at 0.49 A.U.s from the Earth. 5- The Moon reaches Full, hampering observations. 7- May reach a peak brightness at +4th magnitude. 7- Passes closest to Earth 0.47 AU, moving at an apparent speed of almost 3 degrees a day. 9- Crosses the celestial equator into the constellation Taurus. 17- Crosses the ecliptic plane and into the constellation Aries. 20- Moon reaches New phase, marking a favorable span for observation. 22- Passes within one degree of the 3.6 magnitude star 41 Arietis. 25- Crosses into the constellation Triangulum. 30- Reaches perihelion at 1.29 A.U. 30- Crosses into the constellation Andromeda. The position of Q2 Lovejoy on New Year’s Day. Credit: NASA/JPL. 3- The Moon reaches Full phase, hampering observations. 4- Passes less than one degree from the 2.1 magnitude star Gamma Andromedae (Almach). 18- The Moon reaches New, marking a favorable span of time for observations. 20- Passes less than a degree from the +4th magnitude star Phi Persei and into the constellation Perseus. 1- May drop below naked eye visibility. 2- Crosses into the constellation Cassiopeia. 5- The Moon reaches Full phase, hampering observations. 11- Passes less than one degree from the +5 magnitude Owl Cluster. 16- Passes less than one degree from the 2.6 magnitude star Delta Cassiopeiae (Ruchbah). 20- The Moon reaches New, marking a favorable time for observation. 24- Crosses the galactic equator. 1- May drop below binocular visibility. The projected light curve of Q2 Lovejoy, with recent observations (black dots). Credit: Seiichi Yoshida’s Weekly Information About Bright Comets. From there, Comet Q2 Lovejoy drops back below +10th magnitude and passes just a degree from the north celestial pole in late May as it heads back out of the inner solar system. Q2 Lovejoy was on a 13,500 year orbit inbound, and its passage through the inner solar system shortened its orbit by about 5,000 years. Just think, about 13 millennia ago, Mesolithic man was busy domesticating early farm animals. Did they, by chance, look up and catch sight of Comet Q2 Lovejoy? And who will be here to ponder its return passage eight millennia hence? Comet hunting is fun and easy… we prefer to sweep the target area with our trusty Canon 15×45 image stabilized binoculars, though a common pair of 7x 50’s — often favored by hunters and bird watchers — will do just fine. The passage by +7.7 magnitude globular cluster M79 this week will provide a fine contrast in “fuzz balls…” Remember, in comets as in nebulae, the quoted magnitude is often dispersed over a broad surface area, making the objects fainter than a pinpoint star of the same brightness. And Comet Q2 Lovejoy is the first of several binocular comets to look forward to in 2015. Right now, we’ve got our money on comets C/2014 Q1 PanSTARRS, 19P/Borrelly, C/2013 US10 Catalina, and C/2013 X1 PanSTARRS as possible contenders in 2015. And don’t miss +9th magnitude Comet 15P/Finlay, currently in outburst and playing tag with the planet Mars low in the dusk sky. Watch this space (bad pun intended) this coming Friday for the low down on all things astronomical in 2015! -Got pics of Comet Q2 Lovejoy? Send ’em in to Universe Today.